So I will start with my main takeaway from 2017: writing about the politics of development for different audiences is not an easy thing to do. I have always prided myself in being able to talk politics with almost anyone, anywhere. But writing semi-cogently is a different challenge altogether, as this year has shown me with the clarify of a punch to the face. Here are four translation tasks that I have had to deal with, and the realization that has come out of the experience. For the second year in a row I taught a master’s course on Policy Analysis, which should have always been called – and will from now on – Political Analysis of Development Policy. My goal is to make students more critical and self-aware as producers and consumers of development analysis. I cast a pretty wide net theoretically, introducing them to rationality, ideas, advocacy, networks, discourse, and identity, and using these tools to explore a few practical cases. Still, no matter how much I think the material is introductory, Development Studies is a such a big tent that some of our students simply have no clue what to do with basic political theory. And so I spend a large chunk of time trying to translate academese to human-readable language, responding to student queries and generally hoping for the best. For better or worse, I decided to write a book after being approach by a Zed Books editor. It would have been so easy, in retrospect, to gracefully jump off that moving train, and yet I am not known for making easy choices. So much of 2017 involved a pretty frantic rush to finish nine chapters, which were then sent out to reviewers, revised, and finally copy-edited into an honest-to-god book manuscript. 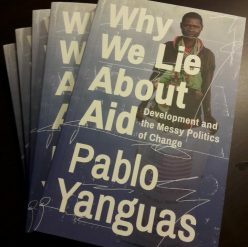 Over time the book project morphed into what is essentially a folk ethnography of the aid industry, capped by a rather emotive plea for a return to humane internationalism – corny, yes, but that does not make it any less true or necessary in my eyes. The translation effort here has been one of making basic concepts intuitive, and turning in-depth case materials into compelling narratives. The jury is still out (the book will be out on February 15th), but a man can dream. The third – and perhaps coolest – translation task of 2017 has been working with practitioners to incorporate political analysis into development practice. This I have done in both overt and sneaky ways. On the one hand, I worked with the International Budget Partnership – already a politically-smart CSO – to develop better analytical tools for country programming and a learning guide on political analysis. Having railed against useless PEA frameworks in aid organizations for years, the time came for me to put my time and effort where my mouth was. It was a fun but tricky process with a long tail of repercussions, so it is hard to tell how good I actually did. On the other hand, as part of my role in DFID’s Strengthening Action Against Corruption (STAAC) Programme in Ghana I have been trying to build bridges between PEA, research, M&E, and management in order to strengthen the overall programme approach. Hopefully we will put together a paper for public release soon-ish, because this has been a positively fascinating experience, and with more success that I would have expected. As much as I may complain about the challenges of translating politics for non-politicos, I still embrace them because they are interesting puzzles to solve. Too interesting, perhaps! The more time and brain I devote to speaking to non-academics, the harder it becomes to return to an academic mindset, which is still required for my job at ESID in Manchester. I spent 2017 trying to catch up with a number of working papers – on an elites dataset, public sector reform in Africa, policy domains… – and in order to truly do so I needed yet another cognitive switch towards the literature, concepts, and theory. Luckily for me I also had to do some dirty work for ESID, including a nostalgia trip involving a review of literature from American political science. And I found some time to read from excellent books by thinkers like Merilee Grindle. So the gears are still turning. So, why does all of this matter? I would say that my four translation tasks this year have driven home a realization that will ring familiar but that is still relevant: development politics lacks a shared language. We are remarkably bad at agreeing on basic concepts, like power, ideas, or incentives. And there are no clear and commonly shared “findings” to build upon (though this is also a problem in political science). We do not have explicit frameworks directly linking theory and practice, forcing those of us with a step in reality to make it up as we go. “Political economy analysis” is not so much a method as a convenient shorthand for taking politics seriously, no less vague and aspirational than “Thinking and working politically”, and easily instrumental for most practitioners seeking to justify programming choices. I have also encountered “PEA experts” who do not appear to have ever taken a politics course, and who are incapable of looking beyond their sectors. At this moment, in my experience, most foreign aid that is politically savvy relies on the inquisitive nature and political instincts of practitioners, not on any kind of systematized approach. The larger problem, as I write in my book, is that development politics as a sub-sub-discipline is still immature, and prone to paradigmatic and sort of strawman-ish debates instead of actual knowledge accumulation. We enjoy the pastime of critiquing economics as a discipline for its far-fetched assumptions and arcane methods, but in the meantime we are still trapped in a stage of “permanent revolutionary science”, to butcher Thomas Kuhn’s term. I used to think that “normal science” was a boring affair, but oh how I yearn for some semblance of normality within this academic community. Whatever the diagnosis, as long as we continue to operate without common foundations, the kinds of translations highlighted above will always be contentious, idiosyncratic, and ad hoc. There is nothing wrong with muddling through as a survival tactic, but let’s not settle for making it what defines our epistemic community.